This clear stamp set features adorable animal images perfect for Valentine's Day! Mouse with balloon pairs perfectly with "Hello squeak-heart", Otter in a sweater matches "You otter be mine" and "to my significant otter", beaver with "Wood you be mine?" and "I'd bea-ver-y happy if you were my Valentine! ", and a porcupine with "You're Porcu-FINE!" and "Quill you be my valentine?" as well as "I (heart) you!" Cling Stamp from Impression Obsession featuring the sentiment "Warm Hugs". Encouragement themed clear stamps from Picket Fence Studios featuring the sentiments "Be strong, it will stop storming soon", "Together we will pick up the pieces", and "Scars are not the signs of weakness, they are the symbols of strength and survival". Use with paints and inks. Perfect for card making, journaling, scrapbooking, and mixed media. Send sweet greetings with this clear stamp set. 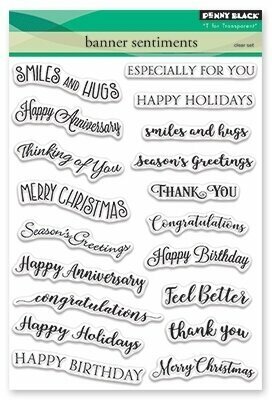 Includes baking lady with cupcakes, cake with candles, oven with bread, cupcakes, single cupcake, oven mits, whisk, and sentiments "Let's bake some memories!" "Wisking you a happy birthday" "Life is short take a whisk" "I loaf you" "Sugar, flour, eggs, and more... A birthday cake with candles galore!" "All you knead is love" "Life is what you bake it" "You make everything butter!" Love themed clear stamps featuring yarn in the shape of hears, and the sentiments "My heart yarns for you" and "Hooked on you". This is a clear photopolymer stamp set measuring 4 x 6 inches. Our clear stamps are made in the USA from the highest quality photopolymer. Cling Stamp from Impression Obsession featuring the sentiment "You're a Sweetie". Cling Stamp from Impression Obsession featuring the inspirational sentiment "Your dream doesn't have an expiration date. Take a deep breath and try again". Cling Stamp from Impression Obsession featuring the inspirational sentiment "Your inner light reflects the true beauty of your soul". Cling stamp featuring travel and vacation sentiments. Cling Stamp from Impression Obsession featuring the sentiment "Today is a great day to be amazing". Hero Arts clear stamp featuring astronauts, planets, a telescope, "fly me to the moon", "you are the best in the universe", and more! Coordinates with HA-DI428. Clear stamps featuring birds and the sentiments "I have so much of you in my heart", "You're the best", "Just for you", "Missing you always", "I'm wearing the smile you gave me", and more. The perfect addition to your craft projects! Made of the highest quality photopolymer and are easy to position, use and store. Clear stamps from Brutus Monroe featuring the sentiments "Be Brave", "Life is Art", "Hey There", and "Hello Sunshine". Cling Stamp from Impression Obsession featuring the sentiment "You can be happy anytime at all for absolutely no reason". Clear stamps featuring the sentiments "You are Loved", "Wishing You Well", "Be silly be honest be kind", and "Choose to Shine". Designs by Sheena Douglass. Acid & lignin free. These versatile and easy-to-use stamp sets are a great way to create beautiful and elegant cardmaking projects. To use these stamps simply peel them from the backing sheet and place onto a acrylic block (not provided) ink the stamp up and stamp. Once you are done simply peel the stamp off the acrylic block and wipe clean with an alcohol free baby wipe or wash in soapy water, leave to dry and return to the clear backing sheet. Clear stamps from Brutus Monroe featuring the sentiments "March to the beat of your own drum", "Rain is just confetti from the sky", "I'm not weird, I am a limited edition", "Gray skies are gonna clear up" and "Normal is boring". Clear stamps featuring beach themed sentiments including "Just Beachy", "Sorry I Was Crabby", "Happiness Comes in Waves", and more. Hero Arts 4″x6″ clear stamp sets offer the best quality in the market. They are made in the USA from genuine photopolymer, which is non-toxic, biodegradable, and designed specifically to transfer ink to paper for a true impression every time. Peel off your stamp from its backing and stick to an acrylic block for easy positioning. Mix and match the designs, then clean with water or stamp cleaner. Impression Obsession cling stamp featuring the sentiment "Believe In Your Own Dreams". Fishes with horns! A set with narwhales galore, along with some s'whale messages. 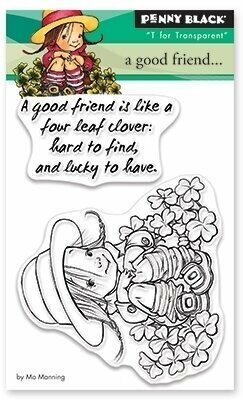 Hero Arts 4″x6″ clear stamp sets offer the best quality in the market. They are made in the USA from genuine photopolymer, which is non-toxic, biodegradable, and designed specifically to transfer ink to paper for a true impression every time. Peel off your stamp from its backing and stick to an acrylic block for easy positioning. Mix and match the designs, then clean with water or stamp cleaner. A cling rubber stamp from Stamping Bella featuring the sentiment "I Have An Idea". 4" x 6" clear stamp featuring many, many birds with virtue words on them! A 4x6 set filled with fun florals perfect for making a statement! 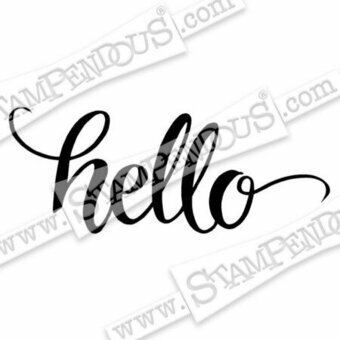 Use the large stamp to frame some large hand lettered sentiments, or add smaller accents with the individual flowers and leaves! Main Image - 3 /7/8" x 1 1/2", Beautiful sentiment - 2 3/8" x 1 1/2", Bloom sentiment - 2 1/4" x 2 1/2", Individual flowers range from 1/4" x 1/4" to 3/4" x 5/8", Flourishes - 7/8" x 5/8", Branch - 3/4" x 3/8". "May your bobbin always be full". Bobbin Wishes Stamps Sew Sweet Collection by Tammy Tutterow is a cling foam (EVA) rubber stamp designed to be used with an acrylic block. Inspired by Tammy's love of sewing, stitchery and all things handmade, her Sew Sweet Collection takes your projects from paper to fabrics and beyond, expanding possibilities in creating heartfelt projects. Approximate Size: Sentiment: 4.53 x 3.73 in. 11.50 x 9.50 cm. The Hero Arts Breathe In Nature woodblock stamp features the relaxing words framed by arrows in a square image. Our woodblock stamps originate from sustainably managed forests and are hand cut and assembled by us in the USA. Cling rubber stamps from Stamping Bella featuring the sentiments "Without change there would be no butterflies", "Be your own kind of beautiful", "Never lose hope", "With brave wings she flies", and more.